Attractive very small antique Victorian mahogany corner cabinet. A lovely small antique Victorian mahogany corner cabinet. We date this cabinet to the second half of the 19th century. The cabinet consists of a side hinged glazed door. The door is fitted with a working lock (key supplied). The interior of the cabinet is fitted with two wood shelves and the rear has been lined with mirrors. The corner display cabinet has a height of 29" (74cm), a width of 19.5" (49cm) and a depth of 14" (36cm) from the rear back corner to the outer top edge of the cornice. 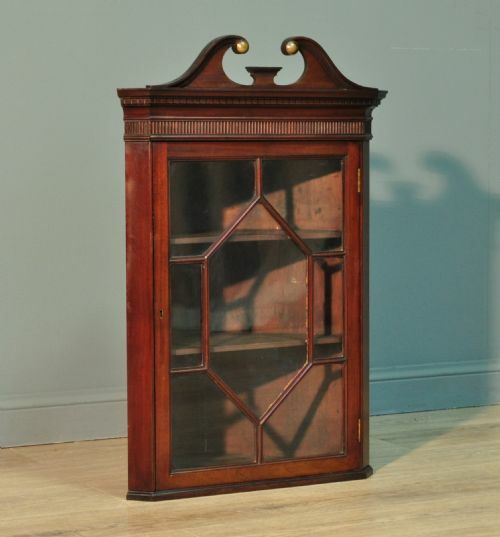 This lovely Victorian mahogany corner display cabinet remains in very good solid condition with only very minor surface markings commensurate with age and usage, including some minor indentations and wear to the finish. This remains a very stylish and elegant Victorian mahogany corner display cabinet which will continue to provide good service for many years to come.